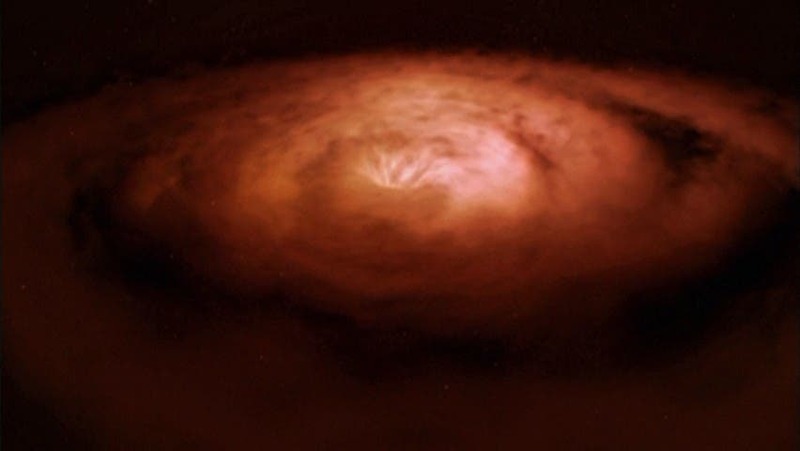 "A supermassive black hole is a time machine. But of course, it's not exactly practical. It has advantages over wormholes in that it doesn't provoke paradoxes. Plus it won't destroy itself in a flash of feedback. But it's pretty dangerous. It's a long way away and it doesn't even take us very far into the future. Fortunately there is another way to travel in time. And this represents our last and best hope of building a real time machine." Stephen Hawking believes in time travel. But, time travel to the future. To Hawking, time flows like a river and it seems as if each of us is carried relentlessly along by time's current. But time, says Hawking, is like a river in another way: "It flows at different speeds in different places and that is the key to travelling into the future." This is an idea first suggested by Albert Einstein over 100 years ago. "So a supermassive black hole is a time machine. But of course, it's not exactly practical. It has advantages over wormholes in that it doesn't provoke paradoxes. Plus it won't destroy itself in a flash of feedback. But it's pretty dangerous. It's a long way away and it doesn't even take us very far into the future. Fortunately there is another way to travel in time. And this represents our last and best hope of building a real time machine. Stephen Hawking thinks four of the world's physicists are wrong believing that time travel is impossible: Hawking sides with Sir Arthur Clarke, author of Space Odyssey 2001 who famously stated that "when a distinguished scientist states that something is impossible, he is very probably wrong". And a lot of distinguished scientists believe that just "Time travel is absolutely impossible". Hawking says: "Although I cannot move and I have to speak through a computer, in my mind I am free. Free to explore the universe and ask the big questions, such as: is time travel possible? Can we open a portal to the past or find a shortcut to the future? Can we ultimately use the laws of nature to become masters of time itself?" Several of the planet's leading scientists, including Charles Liu (author of "One Universe: At Home In The Cosmos"), Brian Greene (of "The Elegant Universe") and Michio Kaku ("Hyperspace") float a raft of objections to the concept of time travel. True to Clarke's statement, sometimes affectionately known as "Clarke's Law", each objection seems more like reason to expect time travel than rule it out. Professor Greene states that all time-travel theories operate at the very boundaries of known physics, and are therefore unlikely to work. As opposed to, say, the boundaries of our understanding being where new discoveries are made. As Sir Clarke said years ago: "The only way of discovering the limits of the possible is to venture a little way past them into the impossible". The other chief objection is the incomprehensible amounts of energy required to punch a hole in spacetime, or stabilize a wormhole, or engineer a double-cosmic-string-ring (yes, that's a real astrophysical concept) capable of bending space hard enough to let us pop back to the past. One point eighty-one jigawatts just isn't going to cut it here, whatever "jigawatts" turn out to be, and most calculations show that powering a time machine with a lightning strike would be like powering a sixteen-wheeler with a bag of jelly babies. (So it seems Marty won't be getting back to the future after all). Of course, the idea of lighting up New York would have had you committed to a mental home in the early eighteenth century. Pre-electricity, schemes were being suggested to transport the increasing numbers of people to the scant available heat and light in times of need. Understand: the amount of energy we now take for granted was so vast, so utterly unimaginable to people in the past that they were preparing to restructure their whole society rather than even attempt to generate it. Of course, this doesn't guarantee that we'll be able to pop back and tell them. The false argument of past scientific ignorance, the "didn't scientists used to think the world was flat" gambit fails because we know so much more now. The key to progress is our cumulative knowledge, developed and refined by generations of researchers into a vast, accurate body of knowledge. We are far more likely to be able to find what's possible than at any point in history. What we know so far is probably right, and allows us to make predictions about what might be possible. "Time travel was once considered scientific heresy. I used to avoid talking about it for fear of being labeled a crank. But these days I'm not so cautious. In fact, I'm more like the people who built Stonehenge. I'm obsessed by time. If I had a time machine I'd visit Marilyn Monroe in her prime or drop in on Galileo as he turned his telescope to the heavens. Perhaps I'd even travel to the end of the universe to find out how our whole cosmic story ends. "To see how this might be possible, we need to look at time as physicists do – at the fourth dimension. It's not as hard as it sounds. Every attentive schoolchild knows that all physical objects, even me in my chair, exist in three dimensions. Everything has a width and a height and a length. "But there is another kind of length, a length in time. While a human may survive for 80 years, the stones at Stonehenge, for instance, have stood around for thousands of years. And the solar system will last for billions of years. Everything has a length in time as well as space. Traveling in time means travelling through this fourth dimension. "To see what that means, let's imagine we're doing a bit of normal, everyday car travel. Drive in a straight line and you're travelling in one dimension. Turn right or left and you add the second dimension. Drive up or down a twisty mountain road and that adds height, so that's travelling in all three dimensions. But how on Earth do we travel in time? How do we find a path through the fourth dimension? "Let's indulge in a little science fiction for a moment. Time travel movies often feature a vast, energy-hungry machine. The machine creates a path through the fourth dimension, a tunnel through time. A time traveller, a brave, perhaps foolhardy individual, prepared for who knows what, steps into the time tunnel and emerges who knows when. The concept may be far-fetched, and the reality may be very different from this, but the idea itself is not so crazy. "Physicists have been thinking about tunnels in time too, but we come at it from a different angle. We wonder if portals to the past or the future could ever be possible within the laws of nature. As it turns out, we think they are. What's more, we've even given them a name: wormholes. The truth is that wormholes are all around us, only they're too small to see. Wormholes are very tiny. "Nothing is flat or solid. If you look closely enough at anything you'll find holes and wrinkles in it. It's a basic physical principle, and it even applies to time. Even something as smooth as a pool ball has tiny crevices, wrinkles and voids. Now it's easy to show that this is true in the first three dimensions. But trust me, it's also true of the fourth dimension. There are tiny crevices, wrinkles and voids in time. Down at the smallest of scales, smaller even than molecules, smaller than atoms, we get to a place called the quantum foam. This is where wormholes exist. Tiny tunnels or shortcuts through space and time constantly form, disappear, and reform within this quantum world. And they actually link two separate places and two different times. "Unfortunately, these real-life time tunnels are just a billion-trillion-trillionths of a centimetre across. Way too small for a human to pass through – but here's where the notion of wormhole time machines is leading. Some scientists think it may be possible to capture a wormhole and enlarge it many trillions of times to make it big enough for a human or even a spaceship to enter. "Given enough power and advanced technology, perhaps a giant wormhole could even be constructed in space. I'm not saying it can be done, but if it could be, it would be a truly remarkable device. One end could be here near Earth, and the other far, far away, near some distant planet. "Theoretically, a time tunnel or wormhole could do even more than take us to other planets. If both ends were in the same place, and separated by time instead of distance, a ship could fly in and come out still near Earth, but in the distant past. Maybe dinosaurs would witness the ship coming in for a landing. "The fastest manned vehicle in history was Apollo 10. It reached 25,000mph. But to travel in time we'll have to go more than 2,000 times faster. "Now, I realise that thinking in four dimensions is not easy, and that wormholes are a tricky concept to wrap your head around, but hang in there. I've thought up a simple experiment that could reveal if human time travel through a wormhole is possible now, or even in the future. I like simple experiments, and champagne. "So I've combined two of my favourite things to see if time travel from the future to the past is possible. "Let's imagine I'm throwing a party, a welcome reception for future time travellers. But there's a twist. I'm not letting anyone know about it until after the party has happened. I've drawn up an invitation giving the exact coordinates in time and space. I am hoping copies of it, in one form or another, will be around for many thousands of years. Maybe one day someone living in the future will find the information on the invitation and use a wormhole time machine to come back to my party, proving that time travel will, one day, be possible. "In the meantime, my time traveller guests should be arriving any moment now. Five, four, three, two, one. But as I say this, no one has arrived. What a shame. I was hoping at least a future Miss Universe was going to step through the door. So why didn't the experiment work? One of the reasons might be because of a well-known problem with time travel to the past, the problem of what we call paradoxes. "Paradoxes are fun to think about. The most famous one is usually called the Grandfather paradox. I have a new, simpler version I call the Mad Scientist paradox. "I don't like the way scientists in movies are often described as mad, but in this case, it's true. This chap is determined to create a paradox, even if it costs him his life. Imagine, somehow, he's built a wormhole, a time tunnel that stretches just one minute into the past. "Through the wormhole, the scientist can see himself as he was one minute ago. But what if our scientist uses the wormhole to shoot his earlier self? He's now dead. So who fired the shot? It's a paradox. It just doesn't make sense. It's the sort of situation that gives cosmologists nightmares. "This kind of time machine would violate a fundamental rule that governs the entire universe – that causes happen before effects, and never the other way around. I believe things can't make themselves impossible. If they could then there'd be nothing to stop the whole universe from descending into chaos. So I think something will always happen that prevents the paradox. Somehow there must be a reason why our scientist will never find himself in a situation where he could shoot himself. And in this case, I'm sorry to say, the wormhole itself is the problem. "In the end, I think a wormhole like this one can't exist. And the reason for that is feedback. If you've ever been to a rock gig, you'll probably recognise this screeching noise. It's feedback. What causes it is simple. Sound enters the microphone. It's transmitted along the wires, made louder by the amplifier, and comes out at the speakers. But if too much of the sound from the speakers goes back into the mic it goes around and around in a loop getting louder each time. If no one stops it, feedback can destroy the sound system. "The same thing will happen with a wormhole, only with radiation instead of sound. As soon as the wormhole expands, natural radiation will enter it, and end up in a loop. The feedback will become so strong it destroys the wormhole. So although tiny wormholes do exist, and it may be possible to inflate one some day, it won't last long enough to be of use as a time machine. That's the real reason no one could come back in time to my party. "Any kind of time travel to the past through wormholes or any other method is probably impossible, otherwise paradoxes would occur. So sadly, it looks like time travel to the past is never going to happen. A disappointment for dinosaur hunters and a relief for historians. erent places and that is the key to travelling into the future. This idea was first proposed by Albert Einstein over 100 years ago. He realised that there should be places where time slows down, and others where time speeds up. He was absolutely right. And the proof is right above our heads. Up in space. "This is the Global Positioning System, or GPS. A network of satellites is in orbit around Earth. The satellites make satellite navigation possible. But they also reveal that time runs faster in space than it does down on Earth. Inside each spacecraft is a very precise clock. But despite being so accurate, they all gain around a third of a billionth of a second every day. The system has to correct for the drift, otherwise that tiny difference would upset the whole system, causing every GPS device on Earth to go out by about six miles a day. You can just imagine the mayhem that that would cause. ffect is the mass of the Earth. Einstein realised that matter drags on time and slows it down like the slow part of a river. The heavier the object, the more it drags on time. And this startling reality is what opens the door to the possibility of time travel to the future. ffect on time, slowing it down far more than anything else in the galaxy. That makes it a natural time machine. ffect would be far more extreme than the gravitational pull of Earth. The crew's time would be slowed down by half. For every 16-minute orbit, they'd only experience eight minutes of time. "Around and around they'd go, experiencing just half the time of everyone far away from the black hole. The ship and its crew would be travelling through time. Imagine they circled the black hole for five of their years. Ten years would pass elsewhere. When they got home, everyone on Earth would have aged five years more than they had. "You just have to travel very, very fast. Much faster even than the speed required to avoid being sucked into a black hole. This is due to another strange fact about the universe. There's a cosmic speed limit, 186,000 miles per second, also known as the speed of light. Nothing can exceed that speed. It's one of the best established principles in science. Believe it or not, travelling at near the speed of light transports you to the future. "To explain why, let's dream up a science-fiction transportation system. Imagine a track that goes right around Earth, a track for a superfast train. We're going to use this imaginary train to get as close as possible to the speed of light and see how it becomes a time machine. On board are passengers with a one-way ticket to the future. The train begins to accelerate, faster and faster. Soon it's circling the Earth over and over again. "To approach the speed of light means circling the Earth pretty fast. Seven times a second. But no matter how much power the train has, it can never quite reach the speed of light, since the laws of physics forbid it. Instead, let's say it gets close, just shy of that ultimate speed. Now something extraordinary happens. Time starts flowing slowly on board relative to the rest of the world, just like near the black hole, only more so. Everything on the train is in slow motion. "This happens to protect the speed limit, and it's not hard to see why. Imagine a child running forwards up the train. Her forward speed is added to the speed of the train, so couldn't she break the speed limit simply by accident? The answer is no. The laws of nature prevent the possibility by slowing down time onboard. "Now she can't run fast enough to break the limit. Time will always slow down just enough to protect the speed limit. And from that fact comes the possibility of travelling many years into the future. erent world from the one they'd left. In one week they'd have travelled 100 years into the future. Of course, building a train that could reach such a speed is quite impossible. But we have built something very like the train at the world's largest particle accelerator at CERN in Geneva, Switzerland. "Deep underground, in a circular tunnel 16 miles long, is a stream of trillions of tiny particles. When the power is turned on they accelerate from zero to 60,000mph in a fraction of a second. Increase the power and the particles go faster and faster, until they're whizzing around the tunnel 11,000 times a second, which is almost the speed of light. But just like the train, they never quite reach that ultimate speed. They can only get to 99.99 per cent of the limit. When that happens, they too start to travel in time. We know this because of some extremely short-lived particles, called pi-mesons. Ordinarily, they disintegrate after just 25 billionths of a second. But when they are accelerated to near-light speed they last 30 times longer. "It really is that simple. If we want to travel into the future, we just need to go fast. Really fast. And I think the only way we're ever likely to do that is by going into space. The fastest manned vehicle in history was Apollo 10. It reached 25,000mph. But to travel in time we'll have to go more than 2,000 times faster. And to do that we'd need a much bigger ship, a truly enormous machine. The ship would have to be big enough to carry a huge amount of fuel, enough to accelerate it to nearly the speed of light. Getting to just beneath the cosmic speed limit would require six whole years at full power. "The initial acceleration would be gentle because the ship would be so big and heavy. But gradually it would pick up speed and soon would be covering massive distances. In one week it would have reached the outer planets. After two years it would reach half-light speed and be far outside our solar system. Two years later it would be travelling at 90 per cent of the speed of light. Around 30 trillion miles away from Earth, and four years after launch, the ship would begin to travel in time. For every hour of time on the ship, two would pass on Earth. A similar situation to the spaceship that orbited the massive black hole. After another two years of full thrust the ship would reach its top speed, 99 per cent of the speed of light. "At this speed, a single day on board is a whole year of Earth time. Our ship would be truly flying into the future. "The slowing of time has another benefit. It means we could, in theory, travel extraordinary distances within one lifetime. A trip to the edge of the galaxy would take just 80 years. But the real wonder of our journey is that it reveals just how strange the universe is. It's a universe where time runs at different rates in different places. Where tiny wormholes exist all around us. And where, ultimately, we might use our understanding of physics to become true voyagers through the fourth dimension."